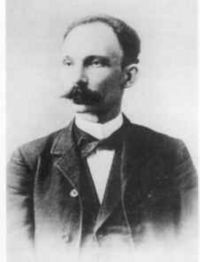 José Julián Martí y Pérez (January 28, 1853 – May 19, 1895), better known as José Martí, was a leader of the Cuban independence movement from Spain and a renowned poet and writer. Martí devoted his life to Cuban independence and firmly believed in the principles of freedom, tolerance, and love. A man of letters who died a patriot's death on the battlefield, he is the Cuban people's national hero and is often referred to as the "Apostle of Cuban Independence." He is also considered the Father of Modernism in Latin-American literature, predating and influencing Rubén Darío and other poets, such as Gabriela Mistral. His best and most revered works were his books for children, La Edad de Oro (The Golden Age) being the most widely read, and his poetry. Several of the verses from his collection of poems Versos Sencillos were later put to music as "Guantanamera," which has become one of Cuba's most recognizable melodies based on a traditional folk tune. José Martí was born on January 28, 1853, in Havana, to a Spanish father, Mariano Martí Navarro, and Leonor Pérez Cabrera, a native of the Canary islands. Martí's father was a sergeant in the Spanish Army who was transferred to Cuba in 1850. However, once in Cuba, José's father changed jobs often. José was the oldest brother to seven sisters, two of which died when José was young. His family was poor, so his sisters would sew to make money and José would help his father with his paperwork for his job. Martí was enrolled at St. Paul's School, which was a branch of the Municipal School for Boys in Havana, a local public school. Here, he met Rafael María de Mendive, an influential person in Martí's political thoughts. Mendive was a well known poet, teacher, editor, and patriot who firmly believed in Cuban independence. He taught Martí to appreciate poetry and literature, and urged him to become aware of the political and social situation in Cuba. When Martí was still young, he witnessed a slave being hung from a tree when he was riding his horse in the countryside. Thus, he came to resent Spanish rule of his homeland at a young age; likewise, he developed a hatred of slavery, which was still practiced in Cuba. When it came time for Martí to attend high school, Mendive offered to pay for his classes, as Martí's family could not afford the tuition. He attended the Instituto de Havana (1866-69), where Mendive encouraged Martí to write and engage in the literary activities at school. Martí became Mendive's helper and was allowed to borrow books from his library. In the afternoons, he would attend discussions of Mendive's older students and listen to them talk about things such as poetry, farming, the news and politics. In 1869, he published his first political writings in the only edition of the newspaper El Diablo Cojuelo. That same year he published "Abdala," a patriotic drama in verse form, in the one-volume La Patria Libre. His famous sonnet, "10 de Octubre," was also written during that year, and was published later in his school newspaper. The Isla De Pinos (today called Isla de la Juventud) where Marti was sent before being repatriated to Spain. In October 1869, Martí and his best friend, Fermín Valdés Domíngez, were laughing in Valdés' house when Spanish volunteers (police force) overheard the two boys and thought they were laughing at them. The volunteers searched Valdés' house and found a letter written by the two boys that criticized a fellow student of Mendive, who had joined the Spanish Army. Martí was arrested, then incarcerated in the national jail following an accusation of treason. Martí assumed responsibility and was condemned to six years in prison. His mother tried arduously to free her son, who was still a minor at the time, at 16, by writing letters to the government; his father went to a lawyer friend for legal support, but all efforts failed. Eventually Martí fell ill; his legs were severely lacerated due to the chains in which he was bound. He was therefore transferred to the Isla de Pinos instead for further imprisonment. Following that, the government decided to repatriate him to Spain. In Spain, Martí studied at the Central University in Madrid (1873) and later transferred to the University of Saragosa, receiving a degree in law in 1874, and a later a degree in liberal arts. During his studies, he found a job as a tutor, attended the theater, concert halls and art galleries, and became acquainted with other Cuban exiles in Spain. Martí then turned to writing for the cause of Cuban Independence. He wrote articles on the wrongs of Spanish rule in Cuba. In 1871, wrote "El presidio político en Cuba" (The political prison in Cuba), which informed the Spanish people of injustices he suffered in Cuba because of the Spanish government and pleaded for the liberation of Cuba. Upon graduating from the University of Saragossa, Martí moved to Mexico to join his family. However, when he arrived, he learned that his sister Ana had past away. He published his first poem in her memory. Martí established himself in Mexico City, where he began his literary career and worked as a journalist. He was hired by Mexico City's La Revista Universal (The Universal Review), a weekly newspaper that covered literary and artistic affairs as well as national news. Martí published poems and articles on Mexico City's cultural life and issued bulletins detailing Mexico's progress under its liberal government, using the pen name "Orestes." Under his own name, he wrote articles on Spanish and Cuban politics. Martí became one of the most important members of the newspaper staff and a respected public figure in Mexico. His opposition to the military regime in Mexico led Martí to leave Mexico for Guatemala. He went to Guatemala City in March 1877, where he was appointed to the faculty of the Central School teaching history and literature. He edited the university newspaper, lectured, and founded and took part in several literary and artistic clubs. Martí became a well-known figure in the city's social and political life. However, his opposition to the governmental abuses in Guatemala eventually led him to leave that country as well. He then traveled to France, where he spent some time before secretly returning to Cuba under the assumed name Julián Pérez in 1877. He learned that the rebel situation in Cuba was not good, as the war had caused widespread unemployment. As there was not much Martí could do, he returned to Guatemala. Then, in the end of 1878 The Ten Year War in Cuba ended, and Martí was allowed to return to Cuba legally. He attempted to practice law, but was not allowed to do so, due to his past prison record. 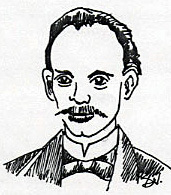 Martí began writing pamphlets to promote the cause of a free Cuba. In 1877 he married Carmen Zayas Bazán, and in 1878, his son, Jose Francisco, was born in Cuba. In August 1879, La Guerra Chiquita (The Little War) began and the Cuban government asked Martí to renounce his revolutionary views and support Spanish colonial government; he refused and was once again deported to Spain. His wife and son remained in Cuba. In 1880, Martí moved to New York City and immediately got in touch with the Cuban community of rebels and exiles. After a year in New York, he was offered a teaching position on March 21, 1881, in Venezuela. He left New York for Carcaras to work as a literature professor. He founded the magazine La Revista Venezolana (The Venezuelan Review), but it only lasted two issues. He offended authorities by writing an article in praise of a writer who was considered a political outcast in Venezuela. Thus, he returned to New York City, where he lived from 1881 to 1895. José Martí is often called the "Apostle of Cuban Independence"
Back in New York, he became a member of the Cuban Revolutionary Committee and began writing, teaching, and lecturing on behalf of the Cuban revolution. He served as a joint consul for Uruguay, Paraguay, and Argentina in New York City. He mobilized the Cuban exile community, especially in Ybor City (the Latin quarter of Tampa) and Key West, Florida, to revolution and independence from Spain, while lobbying to oppose U.S. annexation of Cuba, which some American politicians desired. On November 26, 1891, he gave a speech in which he spoke of the need to prepare for war against Spain—he said he did not consider it a war of hate, but an act of love. This speech, known as his famous "Liceo" speech, outlined his vision of what he thought Cuba could be—a land of racial harmony and justice for all. His motto was, "Everyone together and for the well-being of all." As Martí continued to travel and speak to gain support and financing for the war against Spain, he drafted a statement of the aims of the revolutionary movement. In January 1892, he founded the Cuban Revolutionary Party with the purpose of gaining independence for both Cuba and Puerto Rico. The existence of the Cuban Revolutionary Party was formally announced on April 10, 1892. In 1894, he left planning to go to Cuba and fight for revolution, but was intercepted in Florida. On March 25, 1895, Martí published the Manifesto of Montecristi together with Máximo Gómez, proclaiming Cuban independence, an end to all legal distinctions between the races, friendship with Spaniards who did not oppose the independence, and war with all who stood in the way of independence. On April 10, Martí arrived off the coast of Cuba with a small force of rebel exiles, including Gómez as military commander. Upon reuniting with Major General Antonio Maceo (who was second in command of the army behind Gómez), Martí was promoted to Major General of what they called the Liberation Army as a recognition of his importance to the revolution. The army made a camp at Dos Ríos, where Gómez learned that Spanish forces were in the vicinity. The troops left camp to find them and engage in battle. However, Martí was ordered to stay behind due to his poor health—he was still suffering from the long-term effects of the injury he had received in prison. On May 19, 1895, Martí heard the sounds of nearby battle and leaped on his horse to help, despite orders to remain at camp. 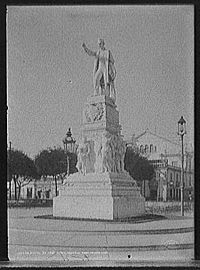 He was recognized by Spanish soldiers who shot and killed him at the Battle of Dos Ríos. The Spanish took possession of his body, buried it close by, but then exhumed it upon realization of his identity. I will die facing the sun). Martí's style is still considered a model of Spanish prose. His collected writings in 73 volumes appeared in 1936-53. The main body of Martí's prose was journalistic in nature, written for newspapers and magazines. In his essays he always reaffirmed his anti-colonialist and anti-racist beliefs. During his New York years, Martí published his first books of poems, Versos Libres (Free Verses) (1891), Ismaelillo (Little Ishmael) (1882), and Versos Sencillos (Simple Verses). Martí wrote Ismaelillo for his son, and it was later described as a guide to the art of being a father. The book consists of 15 poems describing the anguish he felt at being separated from his son during his exile. It was the first example of the Modernist movement in Latin American literature, and was noted for using new forms and meters, everyday language rather than flowery Spanish verses, and not being restricted to the use of rhyme. In Versos Sencillos, Martí describes his admiration for nature, his love of Cuba, the importance of friendship, and his feelings about injustice. These poems reflect very personal experiences and feelings, and contain many of his best-known poems. He writes about poetry, racism and how art teaches important things in life. After his death, a Cuban composer (Joseíto Fernández) put music to the words from one of Martí's poems from Versos Sencillos. The song, known as "La Guantanamera" was one of the most popular songs in Cuba and became known throughout the world. The poem was also popularized in the U.S. as the folk song "Guantanamera" in the 1960s. Although José Martí is usually honored as the great poet, patriot and martyr of Cuban Independence, but he was also a translator of some note. Martí learned English at an early age and began translating at 13. He continued translating for the rest of his life, although the period of his greatest productivity was during his stay in New York from 1880, until he returned to Cuba to die on the battlefield in 1895. He translated several books for the publishing house of D. Appleton and Company, and did a series of translations for newspapers. As a revolutionary activist in Cuba's long struggle for independence he translated into English a number of articles and pamphlets supporting that movement. As a journalist, Martí was much involved in writing for Spanish-speaking audiences about the assassination attempt and eventual death of President Garfield in 1881. Using several New York newspapers as sources, Martí took the basic accounts and translated them, but also added personal touches which in his view were necessary to convey the appropriate emotional tone to a Latin audience. In so doing he showed his skill as a translator as well as his creative abilities as a journalist and author. During his years as a diplomat in New York, Martí wrote for the major newspaper La Nación of Buenos Aires, and his candid commentaries for that paper during the 1889-1890 First Inter-American Conference in Washington provided a neat counterbalance to the dry official documentation. His commentary on the strains between the host U.S. delegation and the aggressively independent Argentine delegation are especially illuminating. 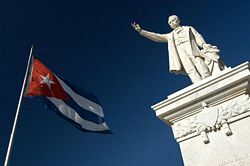 Although the Spanish-American War did not end until approximately three years after Martí's death, many historians and political writers have said that he did more for the liberation of Cuba than any other Cuban who ever lived. All over Cuba and in the Cuban exile communities in the United States, there are statues and tributes honoring his life and work. He will always be in the hearts, minds and souls of the Cuban people as their greatest hero. 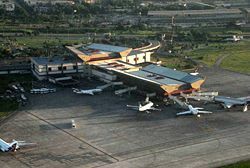 José Martí Airport in "La Havana"
Respect for Martí transcends the divide between pro- and anti-Castro Cubans. 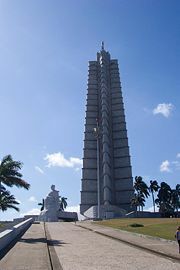 The Castro government maintains a major monument in his honor in the Plaza de la Revolución in the Vedado area of Havana, erected in the final days of the Batista regime. José Martí International Airport in Havana and the town Martí were named after him, while many towns in Cuba have streets named after him. At the same time, José Martí Park, Ybor City, Tampa, Florida, contains a life-size statue of Martí. The Martí Park and statue stand further down the block from the mammoth Ybor Cigar Factory complex, where from the ornate wrought iron porch, Martí urged cigar workers to join the fight against the Spanish dominating Cuba. 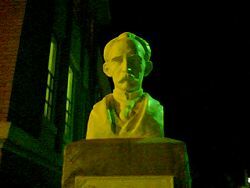 There is also a bust of Martí in Ybor City located in front of the Cuban Club. On the Northeast corner of Bayview Park, in Key West, Florida, there is a memorial and bust of Martí which bears the inscription, "THE CUBAN LIBERTY APOSTLE WISHED TO OFFER TO THE PEOPLE OF KEY WEST WHAT WAS LEFT OF HIS HEART. THIS MEMORIAL PERPETUATES HIS DESIRE." The United States sponsors an anti-Communist broadcast service aimed at Cuba, named Radio Martí, after Martí. ↑ Goodnough (1996), pg. 24. ↑ Goodnough (1996), pg. 37. ↑ West (1994), pg. 21. ↑ Goodnough (1996), pg. 71. ↑ www.kirjasto.sci.fi, José Martí (1853-1895). Retrieved August 24, 2007. 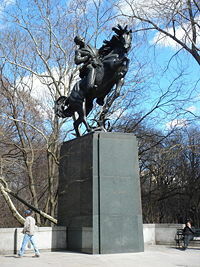 ↑ Anthony Mendoza, Freedom Hero: Jose Martí. Retrieved August 24, 2007. This page was last modified on 6 June 2018, at 21:15.